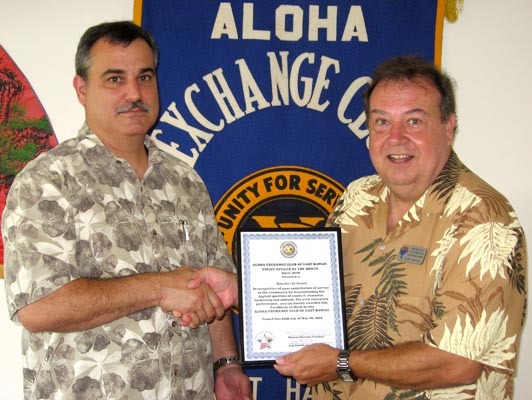 Aloha Exchange Club President Winston Churchill, right, presents an ‘Officer of the Month’ award to Officer B J Duarte. The Aloha Exchange Club of East Hawaii recognized Officer B J Duarte on Thursday (May 28) as “Officer of the Month” for April. 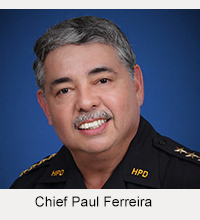 Duarte was honored during a luncheon ceremony at Coqui’s Hideaway Restaurant in Hilo for his efforts in solving a robbery at Rainbow Falls in Hilo. 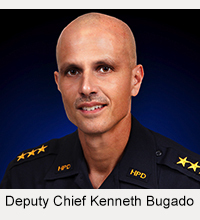 Because of Duarte’s investigation, four suspects were referred either to the prosecutor’s office or to Family Court for charging decisions, and the victim will get back his stolen items.